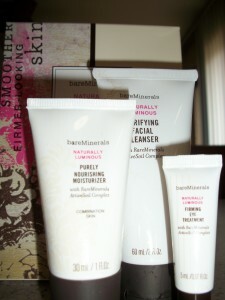 As part of a MomFuse Pop alert, I received three different bareMinerals Skincare products to review. They must have been paying attention to my first post about their launch, because I got exactly what I said I was dying to try. I received a 30-day “Try Me” kit containing the Purifying Facial Cleanser, the Purely Nourishing Moisturizer for Combination Skin, and the Firming Eye Treatment, all in a pretty little package. I’ve been using them for about a week now, long enough to form a good impression. The Skincare Purifying Facial Cleanser works fantastic. It foams up nicely, cleans my face and rinses away without leaving behind stubborn residue. It is a really mild cleanser. I have relatively sensitive skin, and most purifying cleansers sting a bit, but this one doesn’t at all. I also love that it doesn’t make my face feel all dried up and tight after I rinse it away. I definitely notice a difference, my skin feels lighter, smoother, and refreshed after use. The cleanser contains no artificial perfumes, and the overall scent is very faint. I can’t really identify the odor, but it isn’t unpleasant. Maybe a little on the fruity side, but I can only really smell it if I cup my hands over my face while rubbing in the cleanser. The Purely Nourishing Moisturizer for Combination Skin left my skin feeling soft and supple. I have to admit, I look horrible in the morning. Puffy, red and awful. Take my word for it, because I’m not showing you. I am just not one of those people who wakes up pretty. I love the Purely Nourishing Moisturizer because it tames my crazy morning skin by toning down the redness and waking up my dull complexion. It has just the right texture, not too thick or runny. It goes on smooth and absorbs quickly. I’ve noticed that it takes a smaller amount to cover my face than I have to use with some other moisturizers. As with the cleanser, the moisturizer has a very faint scent, this time almost Earthy. Again, you have to really be trying to notice it, otherwise it’s almost scentless. I inherited many of my better qualities from my grandmother. However, along with traits like determination, creativity and stubbornness, I also inherited her dark circles and puffiness under the eyes. I am constantly trying to find something that really works to fix those issues. While the Eye Firming Treatment doesn’t completely take care of the dark circles (honestly, I don’t think anything will), it does help reduce the puffy look and even out the delicate under-eye area. Like the moisturizer, it goes on smooth and absorbs quickly – a little goes a long way. It also helps get rid of that bleary-eyed raccoon look I have going on in the morning. All in all, I really like the bareMinerals Skincare products that I received. I’m looking forward to seeing how they perform over the full 30 days.